With the fourth installment of the Pirates of the Carribean franchise hitting the shores soon, I figured, similar to my Fast and Furious series post, that I would provide a summation of my thoughts on the previous three films, using the older reviews that I put together at the time. Since these are older, once again, it really reflects how I've gotten marginally better at this over time. Still, I enjoy this series enough that I revisited them this past week and continue to enjoy what they have to offer. Yes, they are all too long and overly plotted, but there is a sense of fun that I get out of each installment and I appreciate the imagination that goes into building the worlds for each of these films. So, enjoy another look at these films, before they really do become dead in the water. Barbossa: You best start believing in ghost stories Miss Turner. You're in one. From 2003. A lot more fun than I anticipated when first going to see it. My skepticism was put off when the movie decided not to just be a gimmick of having a ride for a movie and instead fill the roles with some solid actors, exciting action, an epic soundtrack, and a lot of fun dialogue and story elements. This is a fun pirate film that has a lot of fun in a genre that hasn't proven itself in quite some time. 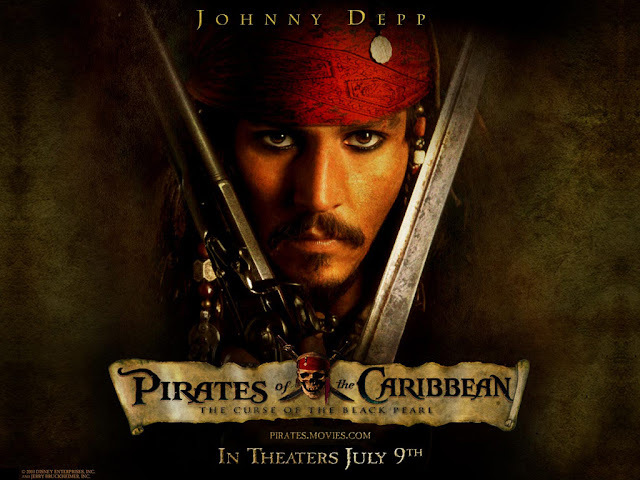 The film revolves around the exploits of Captain Jack Sparrow (Johnny Depp). Sparrow is a bumbling, drunk, but kind-of-brilliant pirate who stumbles his way into the lives of a blacksmith with a hidden past (Orlando Bloom) and the governor's daughter (Kiera Knightley). 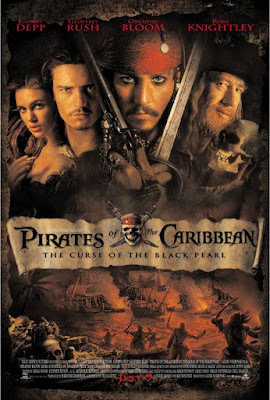 Due to a number of circumstances, a mysterious pirate ship known as the Black Pearl is soon an object of desire for Jack, who used to be its captain. Unfortunately, it is now under the command of Captain Barbossa (Geoffrey Rush), who has plans of his own, due to a curse that has plagued him and his crew. 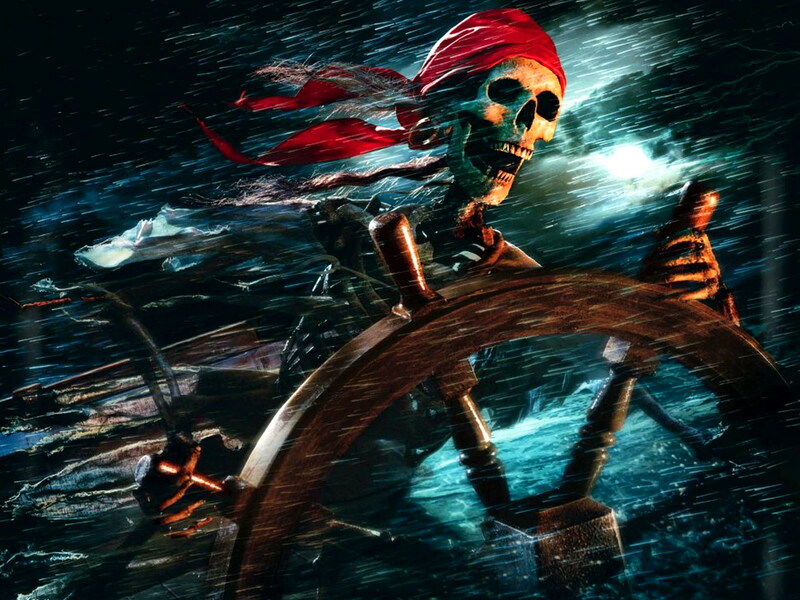 There is a lot of fun with the kind of self awareness involving pirate life, which I enjoy the most in this film. 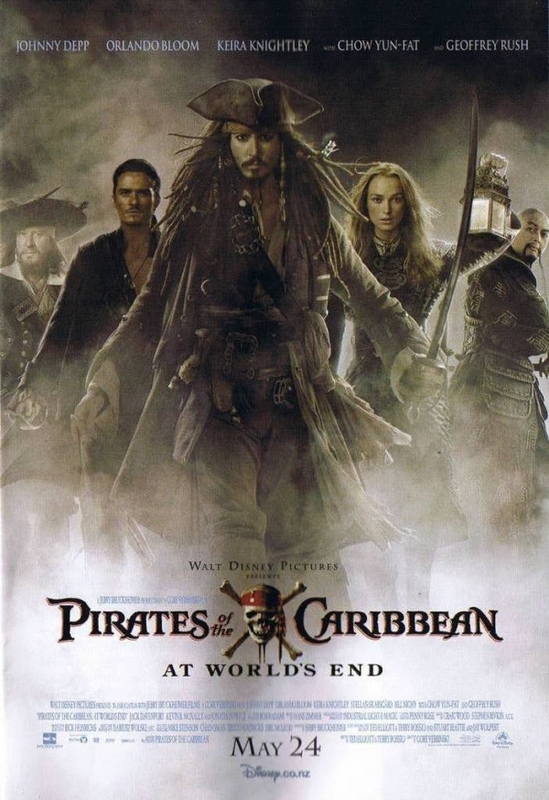 Johnny Depp and Geoffrey Rush are both very good as the opposing captains. They make the film work particularly well. Kiera Knightley and Orlando Bloom do a good job keeping the film grounded when not dealing with the, of course, more interesting and fun characters. I also do enjoy the whole blockbuster nature of this film. It has the sort of grand scale that reflects the scope of the film. As an action film it works, but it is also quite clever in how some of the sequences are handled in the way it mixes in the special effects with live action elements (particularly with the pirate ghosts). The movie goes on for a touch long, but it kept me entertained. There is always something going on and the whole film looks great throughout. Very entertaining. Jack Sparrow: You cannot let him near the chest, man, trust me on this. You can mistrust me less than you can mistrust him. Trust me. From 2006 (Still my favorite). Just as good, if not better than the first. Depp still in his element, once again playing Captain Jack Sparrow as a character so silly, charismatic, smart, and cowardly at once that it all somehow works. Almost everyone else comes back as well, with the addition of Stellan Skarsgard playing it very cool as 'Bootstrap' Bill Turner. There is great, exciting action in this movie, with some thrilling sequences, and amazing visual effects to go along with the many exotic locations. It's the kind of sequel that does a really good job at expanding upon what was established in the first film, without feeling like a carbon copy that has just been done to a bigger effect. This time around, Captain Jack Sparrow, Will Turner, and Elizabeth Swann are all being hounded by the Royal Navy, looking to put the screws on pirates and anyone associated with them. Jack has double trouble in his midst, as he is also being pursued by Davy Jones, who has put the black spot on him, because there is a debt to be paid. Really, it all comes down to finding what is known as the Dead Man's Chest, which is said to contain an item that will help the possessor truly control the seas. Davy Jones is an amazing creation to behold in this film. Rendered completely out of CG, it is an incredibly convincing piece of work created by ILM. It is easily helped by the fact that Bill Nighy is the actor behind the Jones performance, who establishes a great personality for the character. Davy Jones: You are neither dead nor dying, what is your purpose here? The Kraken is also another wonderfully created creature, that makes for great movie magic. Just the sound of the tentacles writhing around the ship is very impressive in itself. That aspect kind of sums up why I really liked this film. The imagination involved in developing this world that the characters exist in is very well harnessed for the purposed of this film. The budget certainly looks to be all on screen, as every frame is filled with great production values and care to have it all feel true to the film. The same humor found in the first, through the character interation and dialogue is also still present and very welcome. While the film is way too overly plotted, it still has that kind of fun in its scripting that lets me kind of go along with it, despite having so much crammed into its story. What I especially like, is how the film does not really follow the traditional sequel rules, which is nice for a big, blockbuster film like this. It may go by the rules of being bigger and louder, but its story structure is not a simple rehash of the first, and I like that. Dead Man's Chest essentially takes the 'Empire' approach instead.. The film is way too long, but basically whatever you liked or disliked about the first is found here, and it's a lot of great summer fun, and gives one hell of a way for people to come back for the third. Officer: That's got to be the best pirate I've ever seen. The Same Officer: (still impressed) Do you think he has it all planned out, or is he just making it up as he goes along?! From 2007. So here it is, the ending of the most successful (only?) pirate movie franchise of all time. That is to say the ending for now, lord knows this will make enough money to have further adventures put in for consideration. Everybody returns for this one, even some of the small players from the first film. Even "The Killer" himself, Chow Yun-Fat, puts down his guns, and pulls up a chair to sit in at this movie. Spoilers beware for those who would read a review of the third film before having seen the second. 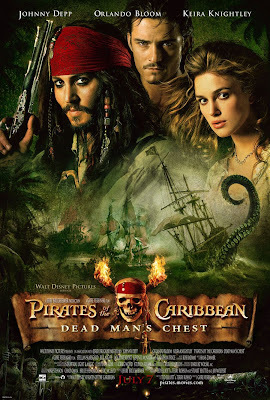 Will, Elizabeth and the Gang start off in the spirit of Return of the Jedi by traveling to dangerous places in order to rescue Han Sol...er Jack Sparrow from Carbon...Davy Jones' Locker, a place where man's greatest fears haunt them for eternity. Traveling with them is my favorite thing about the first film, Geoffrey Rush as Captain Barbossa. His character is easily my favorite in this series. He is just so damn piratey, and his interactions with Jack are great. Of course Jack is rescued, but now they all have to deal with the dreaded East India Trading Company and Davey Jones himself, not to mention possible Gods, and the various pirate lords from the four corners of the earth. But at least a Rolling Stone stops by this time around. The plot of this movie is probably the most needlessly complex of any summer movie based on a theme park ride. There are so many backstabbings, double crosses, out of context betrayals, as well as new plans of action, that it can be hard to keep up with if you blink. Basically, if you had trouble with the plot heavy antics of the second film, than this one will not make things better for you. Although everything is wrapped up quite neatly in the end. This is the darkest of the three films. More people die in the first 20 minutes of this movie than in the first two movies. Lots of swordplay and other kinds of action propel this pirate epic. The key element here, is to remember that this is a pirate movie released in the summer, meaning that it is all about the entertainment value. Who cares about the caliber of acting from the individuals, although it is fairly strong here, especially from my other favorite character, Davy Jones played wonderfully by Bill Nighy. Questioning logic in this movie only makes me wonder how one feels about the fact that in the same movie sea monsters exist and ghosts are all fairly common. What this movie is about is the action and adventure, which it has enough of; the special effects, which are full blown and amazing; the unique characters, which, being a pirate movie, there are plenty of; and the various exotic locals, which there are plentiful and wonderfully shot. Mistress Ching: Who is this traitor? Barbossa: Not likely one among us. Jack Sparrow: Not among us. This film still has the same spirit of the previous two, meaning that things are never too serious. The same humor is found here once again, with the rambling dialogue, slapstick comedy, and the basic lunacy of Jack and other various pirate crew members. It's a long stretch of a movie, but it is never uninteresting, almost everything matters. Of the few complaints I have, the only one that matters is the unnecessary pissiness of the love business between Bloom and Knightley. Its one of those things where you can literally just sit them down for 5 minutes and explain everything, and they would be ok. If I learned anything from the first film, its that these two will always be together. Speaking of Bloom, somehow, despite not being his biggest fan, I was fairly impressed with him this time around, especially towards a key moment at the end of the film, he just looked pretty cool for a change. I must also again mention Davy Jones, as he is still by far one of the best computer created characters ever. His animation is so life-like that one can easily mistake it for a real prop costume and makeup. It also helps that his involvement with the motion capture for performance including all his mannerisms and speech are so greatly handled. And of course, what can one say without mentioning Johnny Depp, who brings the character of Jack Sparrow to life once again as one of the most enduring characters ever at this point. We are even treated to one of the inspirations for Depp's character, Keith Richards in a small role as Father Sparrow. He does exactly what is needed, almost to a Chris Walken extent. Overall, this is a satisfying conclusion to a trilogy, that wraps up pretty much every plot line, has everything you need in a summer movie, and because of that, is very entertaining. I can see what others have complained about concerning these films, and the same problems exist, but I still have fun watching them. Jack Sparrow: And that was all without a single drop of rum!